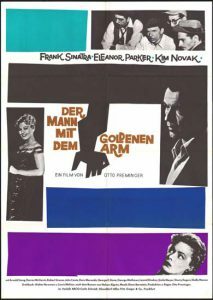 Stars: Frank Sinatra, Kim Novak and Eleanor Parker Director: Otto Preminger Writers: Walter Newman (screenplay), Lewis Meltzer (screenplay) In Otto Preminger’s MASTERPIECE, a strung-out junkie aspires to become a professional drummer, while his crippled wife and a snarly card shark conspire to pull him down. A PizzaFlix Favorite! Nuclear war survivors travel across the country in an amphibious vehicle called the Landmaster to investigate the source of a signal. One of my favorite road trip movies. With intro commentary by Joe Bob Briggs. Secret of the Incas – Synopsis – An Incan legend states that the Inca Empire was destroyed by the gods when a gold and jeweled starburst was stolen from the Temple of the Sun centuries ago, and that the ancient civilization will be reborn once the treasure is returned. 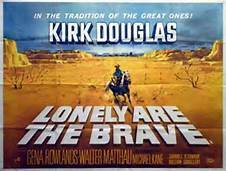 Harry Steele (Charlton Heston), an adventurer, is seeking the artifact, as is his nemesis Edward ‘Ed’ Morgan (Thomas Mitchell), along with Elena Antonescu (Nicole Maurey), an Iron Curtain refugee. Lead story from KNBC Channel 4 News on August 20, 1989, when Gone in 60 Seconds filmmaker H.B. 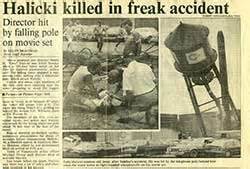 “Toby” Halicki died in a freak accident on the set of Gone in 60 Seconds 2. Season 3, Episode 5 of the B-Movie Roll-Out examines the films of H. B. “Toby” Halicki, an stuntmaster turned independent filmmaker. 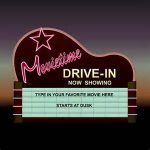 This episode discusses the original “Gone in 60 Seconds” (1974), “The Junkman” (1982), “Deadline Auto Theft” (1983), and the unfinished “Gone in 60 Seconds: 2” (1989), which starts H. B. Halicki and Hoyt Axton. This is meant as a tribute and as a retrospective. Maindrian Pace (H.B. Halicki) is a master car thief who heads an elaborate organization of professionals. Using an insurance investigation company as a front, Pace and his associates buy junked cars from accident scenes, steal new autos of the same model and color, then switch the serial numbers for resale. It’s a lucrative business, but when some shady characters offer them 400,000 dollars to deliver 50 specific luxury vehicles, the challenge is too much to pass up. 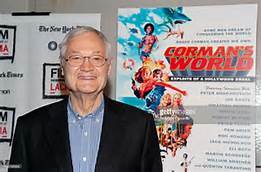 The burglars put on disguises and waste no time in lifting limousines, official racecars, and Rolls-Royces (even stopping by a television studio to steal actor Lyle Waggoner’s convertible). When Pace discovers that a recently stolen Cadillac has a million dollars worth of heroin in the trunk, he destroys the car and the drugs, which infuriates his adversarial partner, Eugene (Jerry Daugirda). Just as Pace is stealing a bright yellow Mustang (code-named Eleanor), the Los Angeles police department gives chase, tipped off by Eugene’s anonymous call. 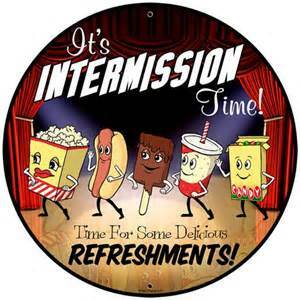 This leads to the meat of the film, a wild 40-minute pursuit which takes Pace and the police through five cities and leads to the destruction of 93 cars. 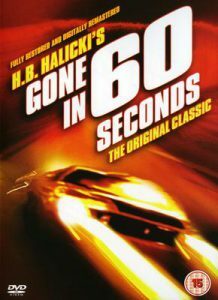 Gone in 60 Seconds was a big hit for first time director/writer/producer/star H.B. Halicki, and inspired a big-budget remake in 2000. Kowalski works for a car delivery service. He takes delivery of a 1970 Dodge Challenger to take from Colorado to San Francisco, California. Shortly after pickup, he takes a bet to get the car there in less than 15 hours. After a few run-ins with motorcycle cops and highway patrol they start a chase to bring him into custody. Along the way, Kowalski is guided by Supersoul – a blind DJ with a police radio scanner. 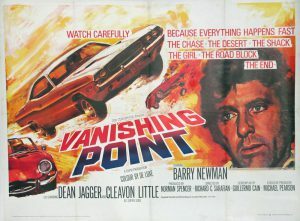 Throw in lots of chase scenes, gay hitchhikers, a naked woman riding a motorbike, lots of Mopar and you’ve got a great cult hit from the early 70’s.